Everybody knows the Three Caballeros. Hot-tempered Donald Duck. Chain-smoking José Carioca. Trigger-happy serial killer Panchito Pistoles. But the movie itself is fading from memory. Even among Disney fans, you won’t find many who have seen it. Which means most people are unaware of the de facto fourth star of the film — a zany little creature known as the Aracuan Bird. What is the Aracuan Bird? The Three Caballeros is an anthology of loosely connected animated shorts taking place in Latin America. The Aracuan Bird shows up in the Aves Raras segment, meaning “potentially boring rare bird sequence.” And it’s up to the Aracuan to keep things zipping. He pops in with a peppy little song, sputtering in and out of frame and notably breaking the fourth wall to shake hands with Donald. He completely steals the scene and possibly the entire movie. But while the Three Caballeros themselves made a lasting impression — even starring in a few theme park attractions — the Aracuan Bird never quite caught on. The Three Caballeros landed their own segment in the Mickey Mouse Revue. As recently as 2018, they had their own stage show at Animal Kingdom. 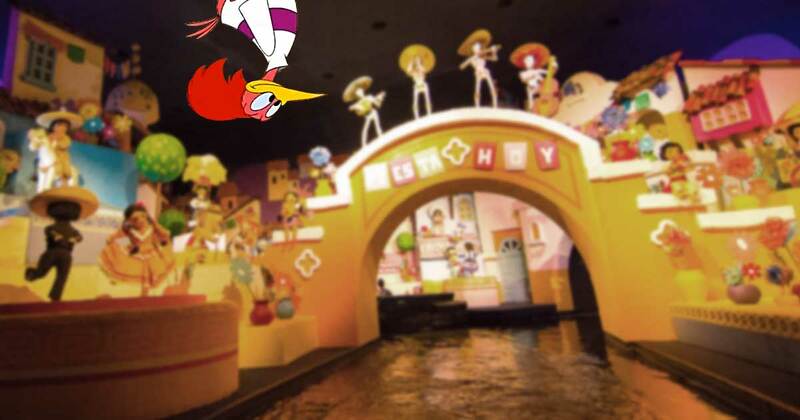 And of course they have starred in Epcot’s Mexico pavilion boat ride since 2007, the subtly named Gran Fiesta Tour Starring the Three Caballeros. And the Aracuan Bird? He popped up in Melody Time, another Disney anthology feature from the 1940s. Then there were a few comics appearances, some cameos in House of Mouse, and apparently he’s a recurring character in something called The Legend of the Three Caballeros, which you’ve never heard of because it was released only for a DisneyLife app in the Philippines. Parkeology did spot him in the amazing bird mural that adorned the ceiling of one of the rooms in World of Disney, which has more than a few references to The Three Caballeros. When it comes to theme parks, the Aracuan is aves raras. Yet if you look closely and keep your wits about you, there’s one more place you can find him. Where is the Aracuan Bird Hiding in Gran Fiesta Tour? Gran Fiesta Tour is sort of a mix between It’s a Small World and the old If You Had Wings attraction at Magic Kingdom. A lot of it is just a series of video screens — which I guess makes it a close cousin to a Universal attraction. The plot of the ride is that the Three Caballeros are wanting to perform a concert, but Donald has gone missing — which I guess makes it also a close cousin to Wayne’s World 2. 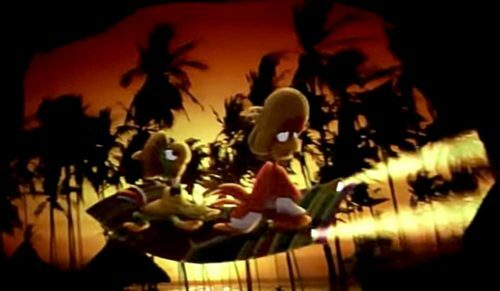 The rest of the ride is about Donald playing tourist in Mexico while José Carioca and Panchito Pistoles search for him on a magic serape, presumably so Panchito can pump him full of hot lead for breaking up the band. One of Donald’s very first scenes has him snapping pictures while wearing a tower of sombreros, because cultural sensitivity. As he spins around, the sombreros tilt towards the camera. And who should be found hanging on for dear life? Yes, famed naturalist John Muir. No, I mean, the Aracuan Bird. He’s visible for less than one second. That’s approximately 1.67% of the running time of the notoriously brief Goofy’s Barnstormer. Side note: Pinto Colvig, who voiced Goofy, also voiced the Aracuan Bird. There’s a generic purple octopus in Gran Fiesta Tour that gets more screentime. Even the magic serape — itself a “character” from The Three Caballeros — gets several scenes in which to shine. It’s a neat little cameo, all the more impressive for how fleeting it is. Probably the coolest aspect is that it’s one for the die-hard fans. 99% of the guests on the ride can’t even name 2 of the 3 Caballeros. Much less the crazy flame-haired bird in a striped swimshirt. Remember to keep a look out for him on your next ride. He will be on the first screen on the right, right after you leave the entry tunnel scene with José Carioca and Panchito Pistoles. Just to be on the safe side, be sure to ride exactly like Parkeology rides It’s a Small World. This entry was posted in Disney Theme Park Hidden Secrets and tagged Epcot, Gran Fiesta Tour. Bookmark the permalink.